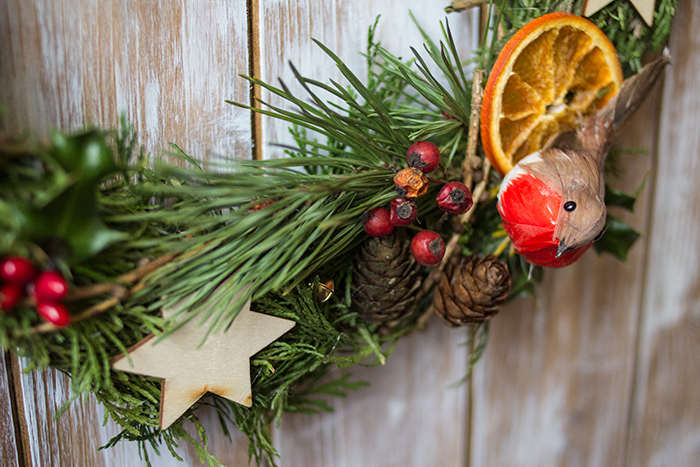 When it comes to Christmas decorations, my favourites are always the ones that combine elements of nature and natural materials. My house is full of all sorts of things found on walks or trips away, from pebbles and shells, to 'interesting sticks' and fossils, so it is only fitting to fill my house with nature inspired decorations come the holiday season. 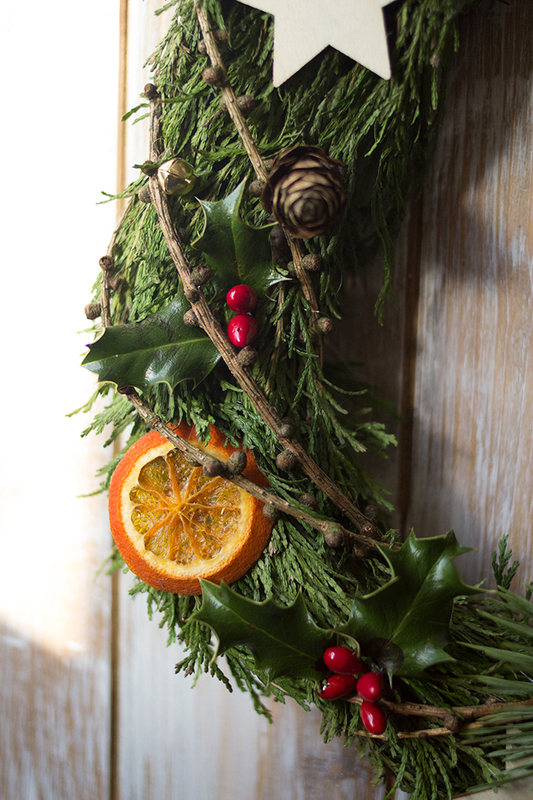 A variety of found natural materials - I used conifer, holly leaves and berries, fallen twigs from another type of conifer and pine cones. All were either found fallen whilst on walks or collected from the garden. Other decorations. 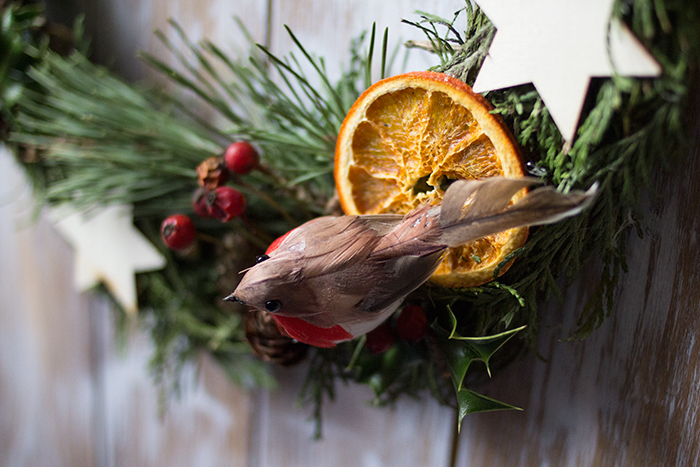 I've used dried orange slices, laser cut wooden stars, fake holly berries, bells, a fake robin and some string. 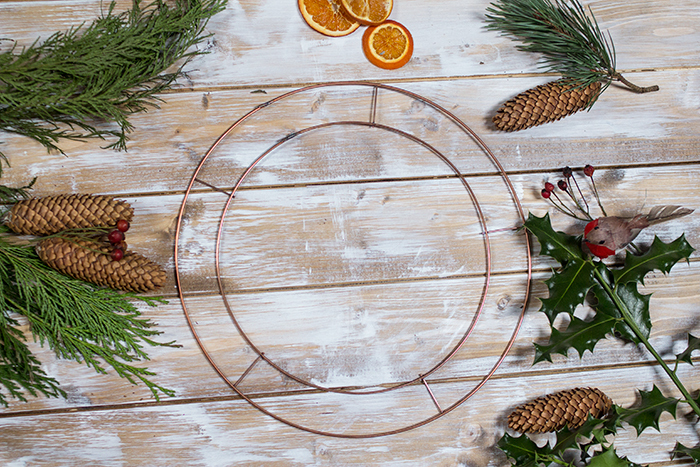 How to make the wreath will depend on what natural materials you've chosen, however the basic method is to weave a main shape through the wreath ring using a natural material that you can use to create a strong base, gluing any pieces that don't stay in place as you go. What you want to achieve is a thickly packed base with no wire showing, for which to add your other decorations to. 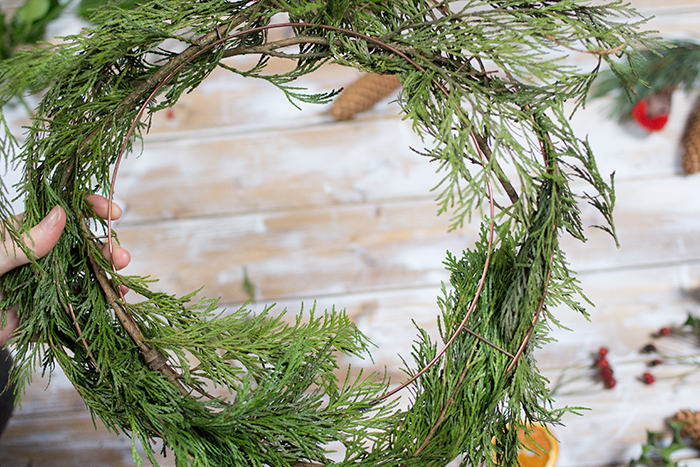 Once I achieved this basic shape, I went on to wrapping some of the twigs I found around the wreath, again gluing as I went to keep them in place. The base of my wreath was now sturdy enough to take other decorations being glued on top. There is no set way to do this, but I always work on the basis of using odd numbers. 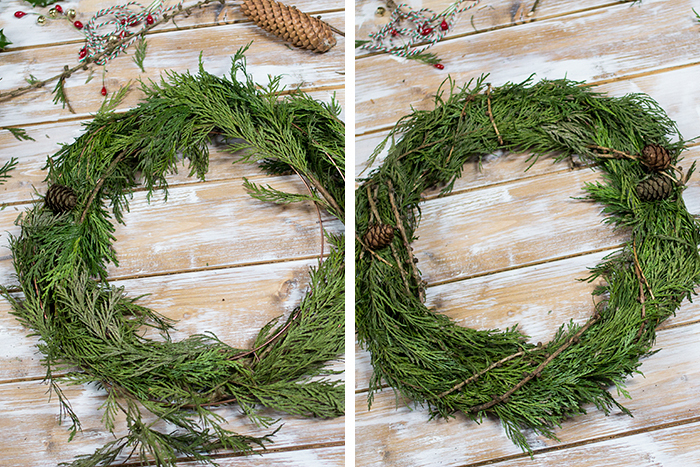 In nature it is very rare to find even numbers of plants all evenly spaced out, so I wanted to make sure I reflected this in my wreath. 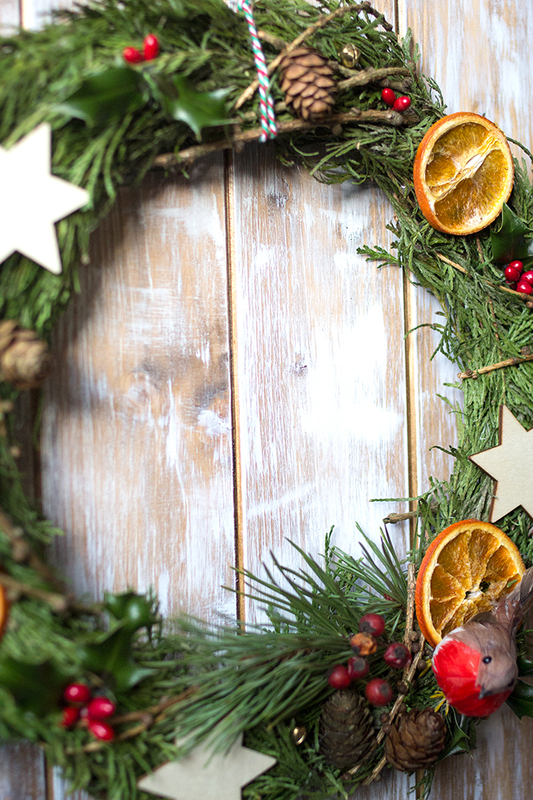 I firstly created a focal area at the bottom right side of the wreath using a different type of conifer branch, holly berries and the robin. From there I laid out the 3 orange slices and 3 wooden stars on top and once I was happy with the placement I fixed them with glue. Next I filled in the spaces using fake holly berries, holly leaves and bells. Again, there is no set method, but I laid them out first and played around with the placement before fixing to the base. Finally I tied the string to the top of the wreath for hanging. I had never made a traditional wreath before this, but had always wanted to give it a go and was so very pleased and surprised with the outcome of this somewhat haphazard attempt! 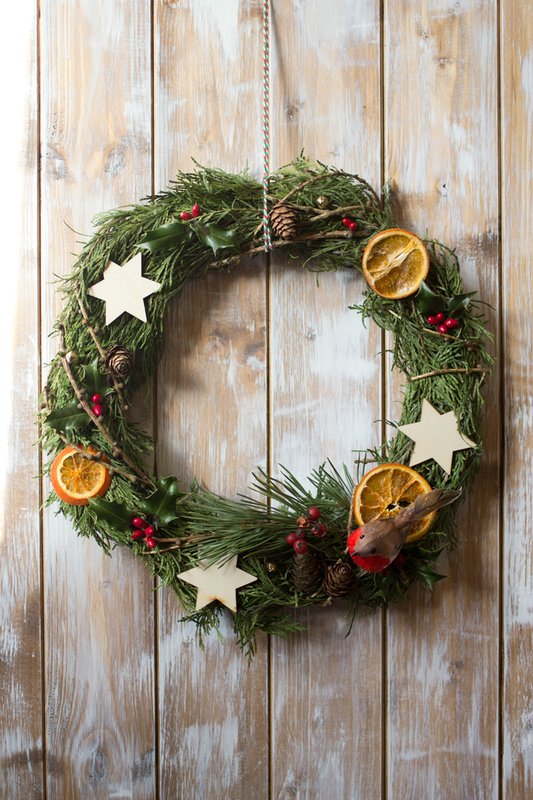 I also hope that my ramblings on how I created it will be of some use if you're planning on having a go at making your own wreath this Christmas. This post was created in collaboration with Turtle Mat who kindly supplied some of the materials to get me started.